Dome tents have been around so long that you’d have thought the manufacturers would have perfected them by now, with this one MSR have. It’s not much to ask for really; a tent just needs to be simple to put up, not weigh a tonne when you are lugging it in a rucksack, not let in water and be sturdy enough not collapse on you in the middle of the night. The Hubba Hubba does all that in style. Lay the ground sheet down, peg it out and snap the poles together. Although the pole configuration looks a little strange, with two long pairs of legs at either end and a short pair in the middle, it is straight forward to erect. The ends of the poles fit through eyelet holes on webbing straps at the four corners with neat thumb-flick tension cleats make it easily tunable to the ideal tension and shape. Once up, there are big side entrance doors that are easy to get in and out of from a lying position. As each person gets a door on their own side it means your partner won’t wake you up if they go for a wander to water the trees during the night. Inside it is surprisingly roomy with plenty of length to stretch out, unless you are well over six foot, and wide enough so that you aren’t cramped up next to your partner, unless you want to be. There’s also loads of headroom making it more practical for use during the day if you’re traped inside due to a downpour. If you are lucky enough to be somewhere dry and can do with out the flysheet, the large mesh section at the apex makes for ideal star-gazing. With more mesh over the doors you almost feel like you are sleeping alfresco. If it is wet out, you won’t be damp inside the Hubba Hubba HP. The flysheet snaps on quickly and easily if you need it. Once it is up, you’re not only well protected from even torrential rain storms, you gain extra living space too as it creates two pyramidal vestibule areas in front of each door. 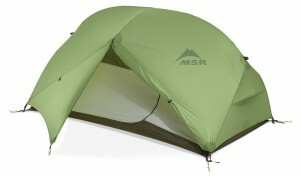 A tent that won’t break you back to carry and provides plenty of room once you’ve pitched it.